Recently I saw a PBS reunion of the Osmond family, which made me think about the Jackson family and how they had the world in the palm of their hands back in the 60's, 70's and 80's. A few months ago I posted a story about a reunion tour that was supposedly in the works. Now I don't know if that will happen, although it probably ought to. It would help with their financial woes. Stiffed by their superstar brother Michael and plagued by decades of bad fiscal decisions, the once-mighty Jackson family is barely scraping by, with one brother stocking groceries, another repairing car and others living at home with mom while hoping for their sister Janet's next handout. They have fallen far from their days as sequin-studded stage stars who could rake in seven-figure paydays for a single performance. Then they were the Jackson Five, the undisputed kings of Motown, a Berry Gordy-led, bell-bottomed global phenomenon. Their first four singles rocketed to the top of the charts, four albums went platinum, and the band of brothers sold more than 100 million albums, second only to the Beatles, while pioneering a multimedia empire that spanned radio, TV, cartoons and magazines. Family patriarch Joseph Jackson, 79, spends most of his waking hours conjuring up schemes he hopes will replenish a bank account that once had more money than the FDIC cared to insure. Peddling musical girl groups in Las Vegas and a book about his family in Germany, Joseph, despite evidence to the contrary, is not convinced that time and the music industry has passed him by. "We can get back out there and set the world on fire," he told The Post last week. "If the Rolling Stones can still rake in the money, so, too, can my boys." Like their days growing up in hardscrabble Gary, Ind., the Jacksons are approaching poverty. Tough times have the clan recalling how the six boys and three girls shared a shingled home with a two-car garage, when Joseph worked in a steel mill and mother Katherine, 77, scoured thrift shops to clothe her brood. But the beauty belies the family's dark fiscal troubles - workers often go months without a paycheck, and Janet Jackson, 41, the new breadwinner in the family, purchased a Vegas home for her mother in anticipation of her eventually losing Hayvenhurst. How did their fortunes crumble? A slew of bad investments, poor advice, bankruptcy, stubborn pride, divorces, IRS debt, child support and a brother, Michael, who would rather give $1 million to Marlon Brando than do a concert tour or record to help make his brothers whole again. The family's downfall is not entirely Michael's fault, others argue. The Gloved One footed their bills for years. But his generosity came at a devastating price: The King of Pop used his vast power and influence to prevent his siblings from plying the trade that led to such mega-hits as "I Want You Back," "The Love You Save" and "ABC." The family filed for Chapter 11 protection in 1997, listing debts of more than $45 million following the collapse of Jackson Communications Inc., which was started by Jermaine. Only Michael, Janet and sister La Toya were spared from the many lawsuits connected to JCI. Janet is said to be worth upward of $150 million, while controversial sister La Toya, 52, is a millionaire. Rebbie, 57, the oldest, has been married for more than 35 years to a successful businessman she met in Gary, and the two live in an exclusive Las Vegas enclave. More broken promises followed Jacko's acquittal. "Michael said after the trial ends, and we know he is going to walk, that we are definitely going out on tour," Jermaine said. "We are going to set the world on fire." Instead Michael fled to the Middle East. Randy Jackson, who persuaded several friends to remortgage their homes, used the cash to help pay Michael's legal and other expenses. Randy said he was left holding the bag when Michael fled to Bahrain. When Michael returned to the States, taking up residence in Las Vegas in December 2006, Randy tried to confront him, but Michael would not have it. A desperate Randy charged the compound housing Michael, but bodyguards stopped him. "We are willing now to go out and do some things without [Michael]," one of the brothers said recently. "We have to." The current family breadwinner. She bought her mom a Vegas home in anticipation of losing the family's mansion, Hayvenhurst, to foreclosure. Like their Neverland colleagues, workers at Hayvenhurst have not been paid for months. Family turncoat who declared Michael guilty during the 1993 molestation case, she earns a living mostly in Europe and in the UAE judging beauty and singing contests. She lives with a wealthy boyfriend in Beverly Hills and has little contact with her siblings. The oldest, she's married to successful businessman Nathaniel Brown. Formed a blues band several years ago and plays at small venues for $500 to $1,500 a gig. On the verge of losing Neverland ranch as well as the family's Encino, Calif., home. He's hiding out in Las Vegas and repeatedly makes promises to his brothers while sabotaging any attempts by them to ply their musical trade. Randy does odd jobs like changing tires to support himself. He was Michael's business manager during the 2005 molestation trial but ran into serious problems with friends after he persuaded three people to take out lines of credits against their homes to help Michael pay his attorney fees and Michael stiffed them. Lives in San Diego, where he works stocking groceries at a Vons supermarket. He fell on hard times three years ago when he was forced to leave his foreclosed home and move into an Extended Stay America hotel with his wife, Carol. The oldest son started an Internet clothing business and is trying to produce records by his sons. Nothing has panned out. Splits time between the parents' Hayvenhurst mansion and his girlfriend's home in the San Fernando Valley. With more than $5 million in federal, state and other liens against him and a 1995 bankruptcy filing, he doesn't work or have a regular income. I saw the Osmonds reunion show, too! It was fun to watch, I thought. I've always been a bog Donny Osmond fan, though. His talent is totally underrated in my opinion. I saw him in "Joseph" and he was nothing short of phenominal. It's a shame about The Jacksons, really. There is so much talent there, but a lot of them just seem plagued by something. Personally, I believe that the allegations against Michael Jackson have been true and on the rare chance you see his children, they are covered in masks or veils. That's very bizarre. When I was reading this, I kept saying, "How can this be?!" Marlon stocking shelves at a grocery store?! Some people (me included) like to refer to The Osmonds as Jackson Five knockoffs. Even though the Osmonds were in the limelight almost a full decade before the J5, there is some truth in that statement when you look at the Osmonds' musical and visual style in the early to mid 70s. However, it now appears as if the Jacksons would have been better off if they had emulated the Osmonds in regards to their family interactions. In the post you mentioned that Michael "used his vast power and influence to prevent his siblings from plying the trade". I am curious, how exactly is he doing this? I loved that PBS special. I was a fan of the Osmonds before Donny even joined the group, in fact I remember when he was first introduced. It's sad about The Jacksons. The Osmonds family unit turned out to be a lot more functional. 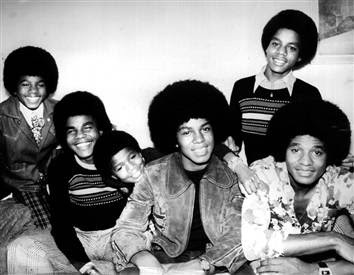 The film about the Jacksons alluded to the fact that their was both physical and emotional abuse perpetrated by Joe Jackson. (My words were poorly chosen) Michael prevents his siblings from performing by refusing to perform with them. I mean, ain't nobody trying to pay to see Tito or any of the other Jackson, except Janet. If Michael agrees to go on tour with the family then everyone benefits. As for the Osmonds, it wasn't until the Jacksons showed up on the scene, that the Osmonds changed their style of music. If you recall they use to do a barbershop quartet act on The Andy Williams Show. OK, thanks for clarifying. I was wondering what could Michael be doing to hurt his brothers financially (outside of not performing with them). I know I wouldn't pay a nickel to see them w/o Michael. As crazy as it sounds, if they got a "Michael soundalike", there would probably be some suckers who would pay to see them. Not top dollar mind you, but still. Regarding the Osmonds, that's what I was alluding to (that they changed their style in the wake of the J5's success). In that regard, I don't think they are that different from the New Kids On the Block (another white act who emulated the style of a black group). I like the Osmonds, but it is what it is.